Cat & The Fiddle: Mother’s Day Special 2015! It is Mother’s Day this coming Sunday! Have you prepared your Mother’s Day Gift yet? Looking something sweet yet affordable but can’t seemed to find what you want? Here is an option for you! Get a cheesecake from Cat & the Fiddle right now! I am quite sure many of you heard of them and ate their cakes before! Well, Cat & the Fiddle is born out of a persistence by Chef Daniel Tay to make gourmet cheesecakes both affordable and accessible to everyone so you will find that the flavours we have created are very unique and we only use the freshest ingredients with no additives, artificial colouring or preservative. Cat & the Fiddle has become synonymous with premium quality cheesecakes baked fresh onsite using only the freshest ingredients with no additives, artificial colouring or preservatives! So, is it as good as it seems to be? This is the first thing that actually stands out from the other bakeries! They actually provide you with this stencil set for you to play with. Cheesecakes is not as boring anymore right? They even teach you how to play with it! 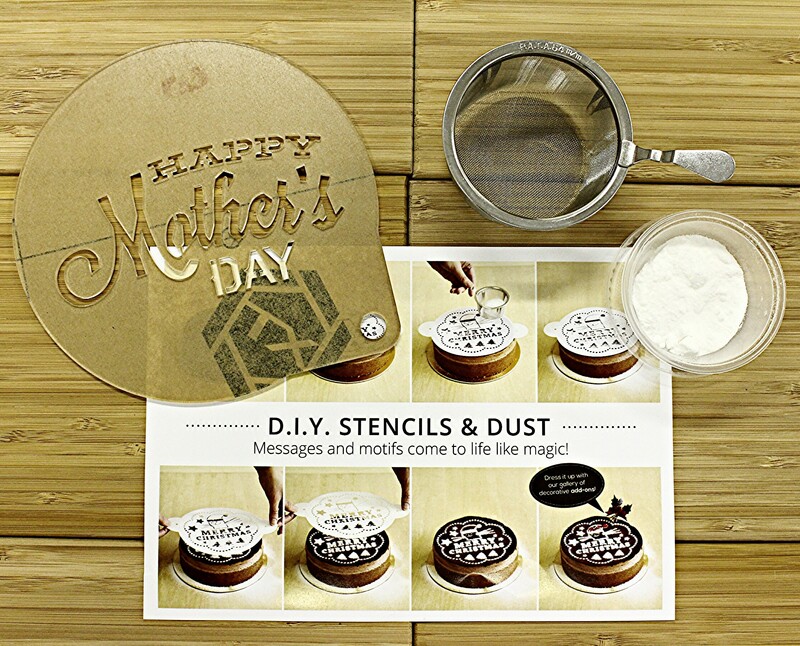 Since you are already getting something so special for your mum, why not make it more special by getting this stencil set? 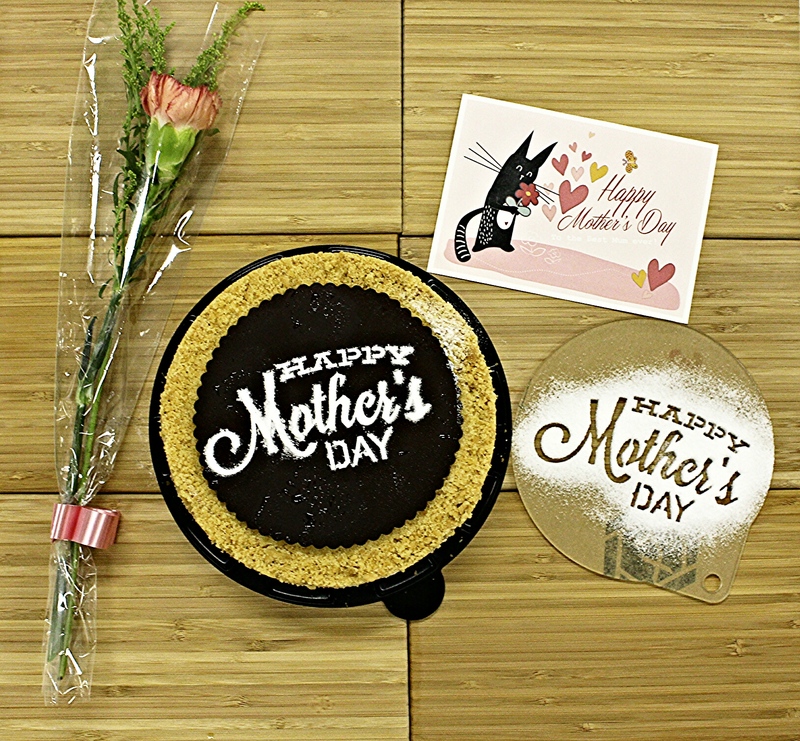 So, after so long, you must be wondering what does Cat & the Fiddle have to offer you for this coming Mother’s Day right? This is one of their newest addition to the list of cheesecakes they have. Apple of My Eye! Don’t you think the name of the cake is already very suitable? This is actually an apple crumble cheesecake! It may look really simple but the taste is surprisingly good for a cheesecake at such an affordable price! The whole cake is filled with lots of crunchy apple chunks, adding on the hints of cinnamon & nutmeg. Together with the buttery yet fragrance pie crumbles and their digestive biscuits base, A PERFECT MIX! But do take note of the way you are going to cut the cake because we totally lost control of it! It actually started to “crumble” when we attempt to cut it so we just took our spoons & ate directly from it. That is the perfect time to get the apple chunks but don’t worry, the whole cheesecake is totally filled with it! Do not wait anymore! Get yours & have fun fighting for those apple chunks with your family this coming Mother’s Day! Before you guys actually start to “attack” the cake, take a photo with your beloved mum and one of their cakes then post them on Facebook/Instagram! Tag @catandthefiddlecakes & “un-private” your account so they can see it! The post that garner the MOST LIKES between the 9th-11th of May 2015 will WIN A CAKE OF THEIR CHOICE! Make sure you tag the RIGHT ACCOUNT! Previous MY SHORT STORIES: Milestone Achieved! Next TOP 5 MUST-GET DIM SUM TO SAVOR AT HOME by YUM CHA EXPRESS!